Whisk together cornmeal, milk, eggs and salt. Note: I think this recipe would be better with equal parts cornmeal and milk, but to honor the past I made it exactly like the recipe called. Like my page holder? 'Tis the season for pomegranates! 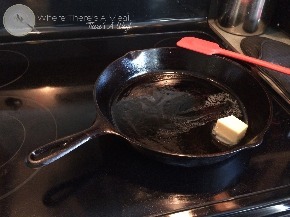 Heat butter in a cast iron skillet to cook slapjack exactly like you would a pancake (Medium heat about 2 minutes each side). Note: Would be delicious with pumpkin chili or vegan chili . 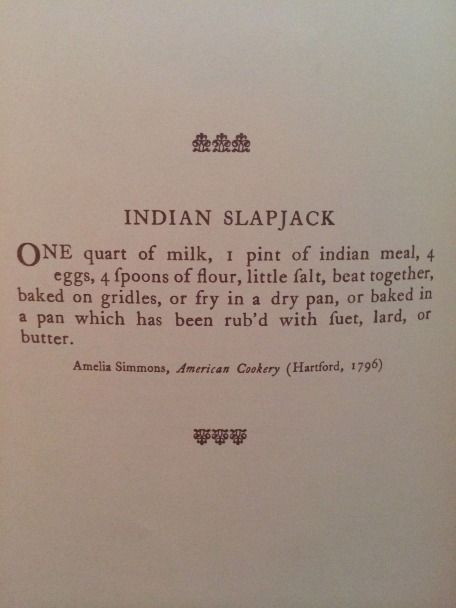 One of America's Earliest Recipes! ​Image taken from "Recipes from the Raleigh Tavern Bakery"
According to wikipedia, ​"American Cookery", by Amelia Simmons, was the first known cookbook written by an American. Mrs. Simmons is noted as being a "good plain cook" for her generous use of a variety of spices as well as her roasting techniques that she used in her recipes. This cook book is also the first to use English cooking methods with American products/ingredients. 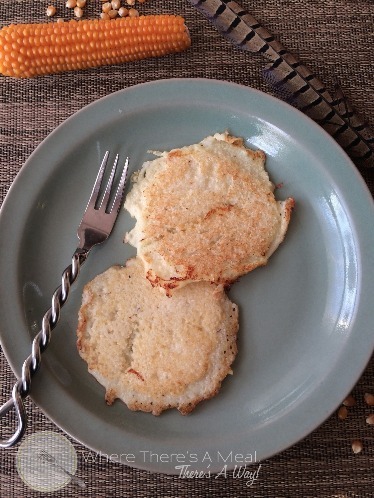 Specifically in this cook book American maize (cornmeal) is substituted for English oats. 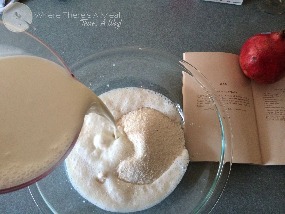 This recipe was really tough to make as it seemed very soupy, however, as I mentioned above, if you use a 1/1 ratio of milk and grits (cornmeal), I think this will fix it. The slapjacks are pretty bland tasting, but a great blank canvas for whatever you want to serve with it. I can just imagine these being served at the first Thanksgiving with some venison and stewed pumpkin (This was more than likely REALLY served at the first Thanksgiving). 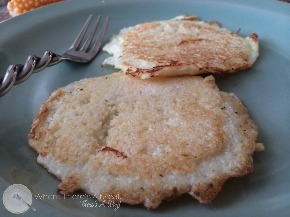 Tucker and I call them Pilgrim Pancakes. Looking for something authentic to serve at your Thanksgiving feast, where there's a meal, there's a way!